An estate agent has become the Conservatives' only directly-elected mayor in Britain after winning the vote in the resort of Torbay. Nicholas Bye, 45, beat Lib Dem Nicholas Pannell in the second round of counting at the south Devon town. Mr Bye polled a total of 7,096 votes to Mr Pannell's 5,197 after the Labour candidate and 11 independents were eliminated at the first stage. The result is a blow to the Lib Dems who have a majority on the council. Although the run-off was between the Conservatives and the Liberal Democrats, the independents between them polled more than 59% and one of them - Gordon Oliver - missed the second count by just 295 votes. 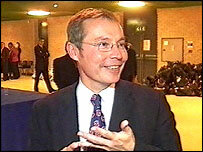 Mr Bye, from Torquay, said the "very poor" turnout of just 24% meant it was not a "triumphant victory". He added: "I want to ask the people of Torbay to give me a chance. It is quite clear from canvassing that a lot of people did not want an elected mayor." Mr Bye, who was born in Paignton, Devon and graduated from Oxford University, has been on Torbay Council for five years and served a term as civic mayor in 2003-04. There are already 12 other directly-elected mayors in England but Mr Bye, who will earn £57,500 a year, is the first in the South West. Britain's previous Tory elected-mayor, in North Tyneside, lost to Labour in May.